On Oct. 30, an Apple conference was held in Howard Gilman Opera in New York) but this time it was not about Apple's main selling item – the iPhone (you can read the most important news from the keynote in our article). We were expecting new iPads. However, information leaked to the public revealed, that Apple could introduce a new version of its laptop. A lot of people did not know whether the new MacBook series will be introduced, or whether the MacBook Air is upgraded only. We know the answer now. And as a bonus, Apple introduced a new version of Mac mini. Tip: Do you want a new laptop? Read our article about the best stores where to buy a laptop. Most users of cult MacBook Air have complained mostly about one thing, and that's the display. Old versions of Air did not even have full HD resolution and the wide bezels are indeed iconic, but let's be honest they are too old and oldfashioned. Apple has heard the calls of its customers (Apple doesn't do that very often) and redesigned the entire screen - it finally has Retina display, which has a resolution of 2560x160 px and much narrower bezels. New owners of the MacBook Air will also no longer have to fill in the passwords, as the fingerprint reader - Touch ID - is located on the keyboard. You can also identify your self with this sensor during Apple Pay Payments. In these years, security and privacy are discussed a hot topic. And Apple knows that. That's why the new MacBook Air also includes a T2 chip that makes all data on the SSD automatically encrypted, and the individual components are also controlled by this chip. We will see if Apple has managed to solve the problems that this chip has just caused (crashing the system etc.). A new type of keyboard will probably not please everyone, because it is often criticized "butterfly keyboard". It suffered from a lot of errors in 2016. If there was a dirt below the keys, the keys were stuck and stopped working. In the MBA we will find a new generation of this keyboard, so hopefully, it will be reliable. Whoever worked with TrackPad (whether in the MBA or MBP) knows it is a very effective tool. Apple is aware of this and therefore, the new MacBook Air has a 20% larger TrackPad, also with ForceTouch. The speakers have been upgraded also, they should be up to 25% louder. You don't find the speakers under the keyboard now but on its sides. Talking about ports, the new version has gone through a drastic slimming diet, there are only two USB-C connectors and a 3.5 mm jack. Nothing more, no more memory card reader, USB 3.0, or MagSafe. All peripherals will need to be connected via Thunderbolt 3 (USB-C). It is also worth appreciating that the new MacBook Air is thinner than its predecessor (about 0.14 cm), lighter by about 100 g, and it takes about 17% less volume, making it the same size as the MacBook Pro. Nevertheless, an excellent battery life of over 12 hours has been maintained. The MBA is therefore ideal for long working days without a charger. But we will see what the first tests will say. Apple is green. What thas it mean? Apple manufactures its new products from 100% recycled aluminum. Apple clearly shows that it's serious about ecology and carbon footprint reduction. The production of the new MBA would produce 47% less emissions than the previous generation. You can choose from 3 colors - Space Gray, Gold, and Silver. Unfortunately, it looks like Apple is not into its purity and simplicity: There are a lot of colors and products variations so its a mess. Let's take a gold finish, for example, there are 3 types: the first you can find on the older versions of iPhone (6s, 7s, 7s), there is another one on the iPhone Xs, and now, there is completely new one on Mac Book Air. It will be very difficult to match all your Apple devices into one color. The Mac mini was also upgraded after 4 years. In its full configuration, this "box" can have up to 64 GB RAM, 2 TB SSD, 10GB Ethernet and Intel i7 processor with Turbo Boost up to 4.6 GHz. However, you will pay a lot for these specs – up to $4199. The main changes have been made with internal components. In full configuration, it can be up to 5 times more powerfull. So there is a redesigned cooling system. which is up to 2 times more efficient. As with the new MBA, the Mac mini includes a T2 Security chip now. Mac Mini still has two USB 3.0 ports, 3x Thunderbolt 3 (USB-C), Ethernet, HDMI 2.0 and 3.5 mm jack. 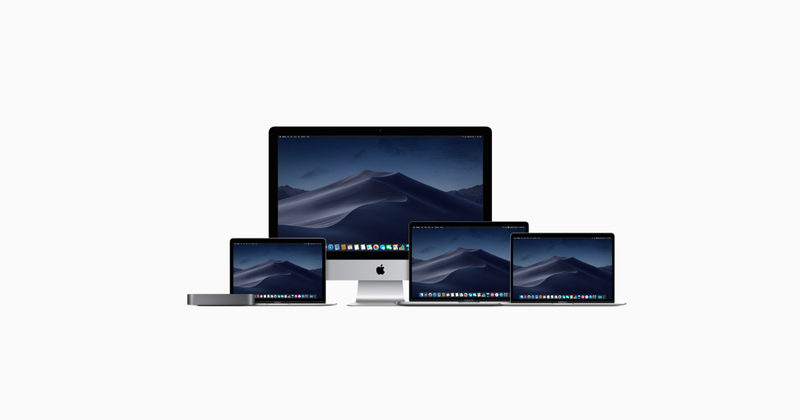 If you are one of the most demanding users and one screen is not enough for you, you will be pleased - Mac mini can work with up to three 4K monitors (2 connected via Thunderbolt 3 and third through HDMI 2.0. Mac mini is, therefore, more suitable for more demanding users who edit video, do a programming or create graphics, and need high performance. Eventually, as we learned from the keynote, it is suitable for business that can use Mac mini as computing center/server. Shopify or CandyCrush runs on Mac mini for example. The new iPad Pro was probably the biggest surprise for most of us. It has long been speculated whether a new version will have a notch or not. Although the display was redesigned, the notch is missing. There is also a Face ID (on the other hand Touch ID is no longer available in iPad Pro) to unlock the iPad. The main change compared to the previous generation is the design and the display. It's not an OLED, but it's a Liquid Retina display (the same screen as the iPhone XR). This does not matter, however, according to the first impressions. Using the new iPad will remind you of the iPhone X (Xs, Xr) controls since the Touch ID has been removed and control can only be done through gestures. A12X Bionic chip takes care of delivering the highest possible power (iPad Pro is designed for professionals). The same chip as in the newly introduced iPhone Xs, Xs Max and XR. Thanks to the high performance, iPad Pro can run even the most demanding AR applications. Probably one of the most discussed products is the Apple Pencil. Thanks to the built-in magnets and one flat side, it "magically" sticks to one of the 4 sides of the iPad and starts charging wirelessly. The pencil also distinguishes tapping, ie. For example, if you double tap on it, you can change the tool (eg from the highlight on the rubber) in the graphics program. Developers will be expected to look for other options for using this feature. For many, it was a surprise that Apple removed the Lightning connector and replaced it with USB-C. The 3.5mm jack was also removed - Apple wants to completely remove the USB 3.0, 3.5mm jack, and other outdated ports and unify them into USB-C, possibly forcing customers to buy AirPods. The iPad Pro can even recharge your iPhone using USB-C, which was not possible with previous generations. It's hard to say how practical this option is, but in an emergency where your iPhone is almost dead, why not. If you want to have an Apple device, you have to pay more – take it or leave it. And this year's products are a great example of that. If Apple finds its customers, it's probably ok. But I don't agree with that. You can see the prices in different countries in the following table. Note: Prices has been taken over from official Apple store.